UC Berkeley's Catherine Crump addresses the privacy council before last night's vote to approve the surveillance technology law. "Throughout history, surveillance efforts have been used to intimidate and oppress certain communities and groups more than others, including those that are defined by a common race, ethnicity, religion, national origin, income level, sexual orientation, or political perspective...."
So begins the preamble to Oakland's Surveillance and Community Safety Ordinance, a sweeping proposed law that would require the city's various departments disclose to the public any new surveillance technologies they plan to acquire and use. City agencies would need to seek city council approval before purchasing new technologies, and the law also imposes reporting requirements so that the public can evaluate the costs and benefits of technologies that monitor and track people. The privacy commission was established in the wake of controversy resulting from Oakland's effort to build the Domain Awareness Center, a city-wide surveillance hub that would have monitored people's activities from a variety of cameras and sensors. Several outside experts praised the commission's work last night, calling the ordinance a model that other cities should follow, especially because the federal and state governments have failed to protect civil liberties in an era when vast amounts of data are being gathered on people, especially police agencies. "Oakland and other California municipalities are in the vanguard," said Nuala O'Connor, who served as the first privacy officer for the U.S. Department of Homeland Security and now runs the Center for Democracy and Technology. Catherine Crump, the co-director of UC Berkeley's Center for Law and Technology told the commission the new law "has the potential to have a nationwide impact." 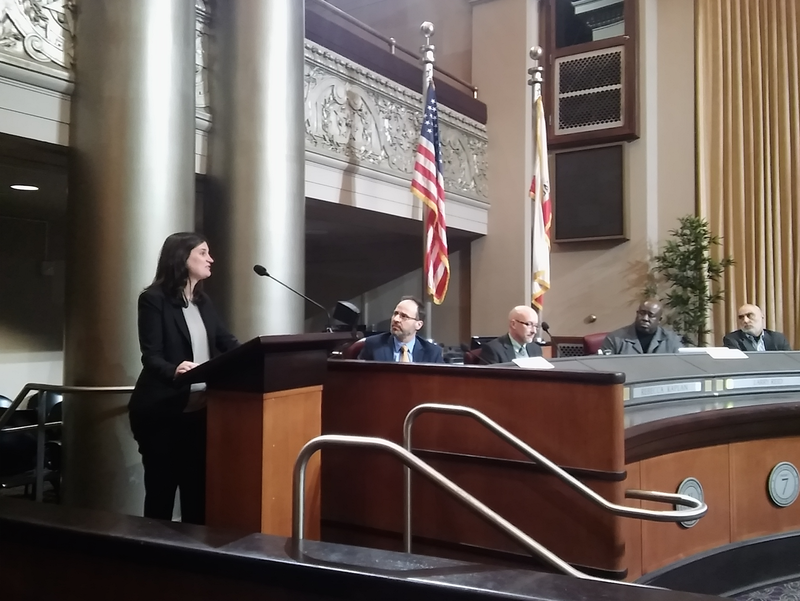 According to Crump, Oakland's adoption of the ordinance and its various requirements signals to law enforcement agencies that the secret acquisition and use of surveillance technologies like cell phone trackers, drones, and license plate readers, is a problem, and that the solution is to require public hearings and to allow the public to evaluate the costs and benefits of these technologies before they're deployed. Christina Sinha, who co-leads the National Security and Civil Rights Program of the civil rights group Asian Americans Advancing Justice, told the commissioners that many Middle Eastern, South Asian, and Muslim-Americans have feared being spied on in this era of Islamaphobia and racial profiling. She praised the ordinance and said it will push back against the "chilling effect" of surveillance and help to "enshrine" the right to public debate. The commission unanimously approved the ordinance. It now goes to the Oakland City Council for final modifications and approval. A copy of the proposed ordinance is available here.